Standard Form Contracts: Don’t End Up Like Sofia Vergara! - Thompson Law, P.C. Standard Form Contracts: Don’t End Up Like Sofia Vergara! I am sure many of you read the title and think I am crazy, right? I mean Sofia Vegara (ABC’s Modern Family) is gorgeous, intelligent, a savvy business woman, and has a great sense of humor. So who wouldn’t want to end up in Sofia’s shoes? Well recently, Sofia has been going through a custody battle for her embryos with her ex-fiancé. Yes, you read that correctly. A custody battle for her embryos. Assisted reproductive technology (ART) has opened a new legal battlefield and if you are not well prepared, you could find yourself in Sofia’s shoes. How to stay out of Sofia’s shoes if you are utilizing ART? If you have been considering this process or have already gone through the process, you likely know that the facility has you sign many consent forms, authorizations, and disposition agreements. What you may not realize is that many of these standard forms govern your rights to the genetic material created and stored and as a result, the legal status of any intended children. Generally the informed consent you sign at the facility gives you the following three options for handling your genetic material at your death: destruction, donation for research and science, or donation to another patient. What the facility fails to tell you is that you are not limited to these options; and in fact, there are many other life events that need to be included to keep your shoes (and your families) out of court. A well-thought-out contract should consider far more than just what happens to your genetic material at your death. When you decide to conceive through ART, there are many questions that need to be adequately addressed in your contract and in your estate plan: What happens to the stored genetic material if you get divorced or separated? What constitutes separation? Is it legal separation? What happens if the divorce is not finalized and you pass away? What happens to your stored fertilized embryos in the event of separation or death? Do they get destroyed? Do you donate the embryos, eggs, and/or sperm? Do you donate them to another person trying to conceive, to science, or to any third party? Do you give your family members the preference to use the genetic material in the event they are having difficulty conceiving as well? Do you keep the genetic material in storage indefinitely? Who pays for the storage costs? Whose property are the embryos? Do you want your partner to use the stored genetic material after you have passed away? What happens to your stored genetic material when you pass away? Does it get destroyed or donated? Who does it get donated to? What happens if you become incapacitate during life? Who has the control over your genetic material? Can your partner use your genetic material during your incapacity? Can it be donated or destroyed? Who will care for the children? If you pass away prior to your child’s birth, who will be their guardian? Can the surrogate terminate pregnancy? If you have a child after your death, is that child your child for inheritance purposes? If you donated genetic material, are the resulting children your children for inheritance purposes? What if you donated to an unrelated third party? As you can see, there are many complex and difficult questions that need to be addressed when you are utilizing ART to conceive children that most standard form contracts fail to address. Don’t squeeze into someone else’s shoes; make sure the contracts you are signing fit your unique needs and wishes. 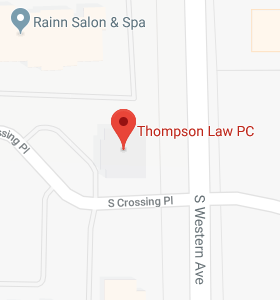 Talk to a Thompson Law attorney today about protecting your rights and wishes and ensuring your shoes (and your families’) stay out of court. Please see my blog next month titled: “Planning for Adoption: Don’t Forget to Modify Your Estate Plan” on how adoption affects not only your estate plan, but your families’ estate plans as well.